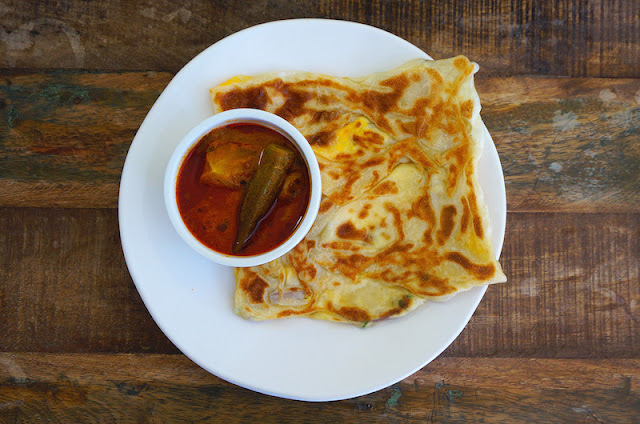 Here is another popular Roti Canai recipe. This one is filled with egg, a bit of green chili and red onion. It's known as Roti Telur in Malaysia, and simply delicious with some Dhal or Fish Curry. Remove the chilled dough from the fridge. Lightly flatten each dough with your fingers and let it rest for about 25 to 30 minutes, or at room temperature. To make the roti canai; Lightly oil your palms and a clean work surface. Flatten the dough with your palms, drizzle a little oil and use a circular motion to stretch the dough. Then place one hand underneath the roti and one hand on top. Flip the dough forward, then move both your hands around the roti, and flip again, about 6 to 10 times, until the roti is thin. Then lightly lift the dough and stretch with your hand until all the edges are paper-thin. Scatter some green chili on the dough, red onion and egg. Spread the egg with a spoon. Then lift one end of the dough and place it in the middle. Lift the opposite end and place on top and fold in the two sides. When ready to cook, heat a flat-bottomed frying-pan (or cast-iron pan) over a medium heat. Pour a little oil to coat the surface. When the oil is nice and hot, place the dough and fry until both sides are golden brown in color.